We’re off to the races again for the FINAL PUSH running up to the Midterm Elections on November 6! 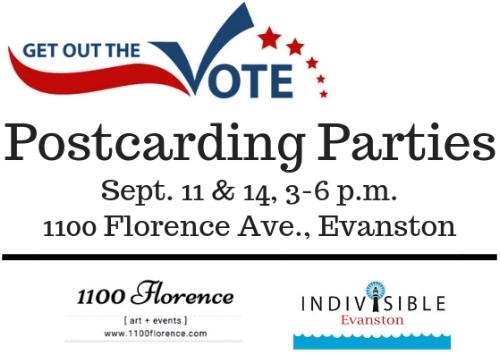 We will host two postcarding parties with our partners are Indivisible Evanston this September to get people out to vote on November 6. Right now we have addresses to get out the vote in Illinois. TUESDAY, SEPTEMBER 11th POSTCARDING OPEN HOUSE from 3:00 - 6:00 PM. FRIDAY, SEPTEMBER 14th POSTCARDING OPEN HOUSE from 3:00 - 6:00 PM. While postcarding, we are excited to share inspirational art on the gallery walls by Evanston Artist Lea Basile Lazarus, for her solo art exhibit, “The Spirit of Community”. Learn more about the show and our art/event space at 1100florence.com.